Yasmin Kadir is the executive assistant and Program Coordinator for Muslims for Progressive Values (MPV). Yasmin is a citizen of the world, having been born to progressive Bangladeshi immigrants and spending her childhood traveling around the world before ultimately finding home on the Central Coast of California. She remembers experiencing the compelling urge to be a part of the people and their social movements while watching Civil Rights documentaries in her 11th grade US History class. Since then, she has dedicated herself to being an intersectional advocate for the marginalized, which she embodies in her career and in her personal life. With MPV, Yasmin has coordinated and implemented national and local programs, such as the Inclusive Islam 4-city Workshop series, a fundraising event in partnership with The Young Turk’s Hasan Piker, MPV-LA’s first WeHo Pride Parade float, and acted as the Project Editor for MPV’s published book, Light Upon Light. 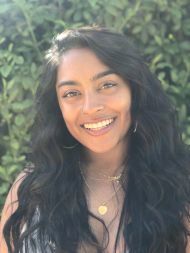 Yasmin is also a 2018-2019 NewGround Change-maker Fellow, a program dedicated to building intra- and inter-community bridges in Los Angeles by deconstructing anti-semitism and Islamophobia. She strives to live by Audre Lorde’s words “I am not free while any woman is unfree, even when her shackles are very different from my own”.